This is the time of year where we find ourselves in an overlap of summer weather and back-to-school schedules. We are still craving summer-time grilling but are in need of speedy recipes that can be on our table quickly. Marinated shrimp is the perfect solution, and it can be prepared swiftly with the help of the KitchenAid® Pro Line® Series Blender. 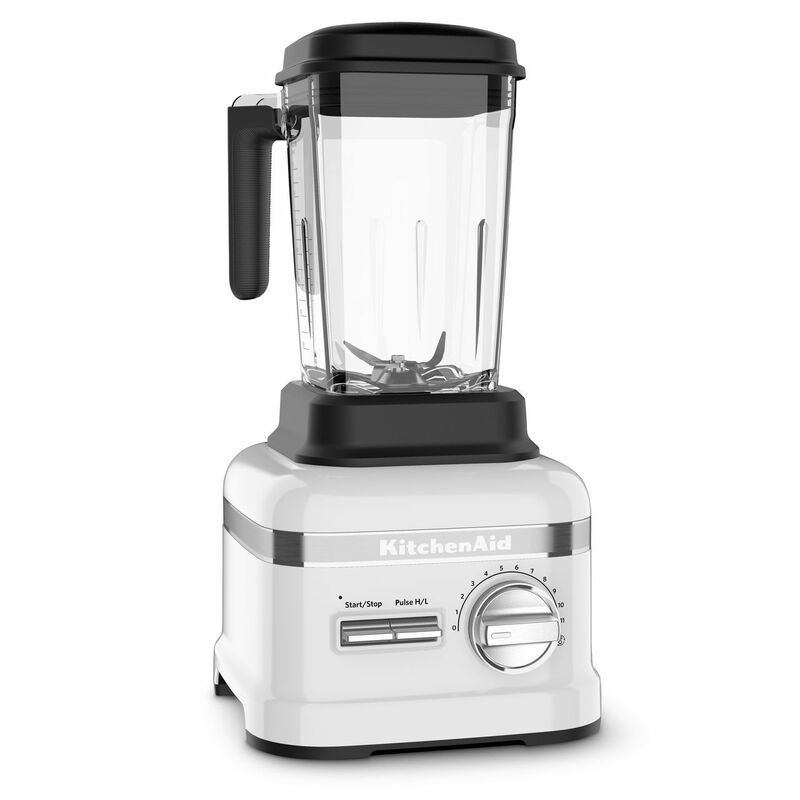 It was designed with a powerful 3.5 Peak HP Motor, making it the perfect blender for all your recipe needs. Today, I’ve prepared two very quick and simple marinades that will pack a serious punch of flavor in just a matter of minutes. 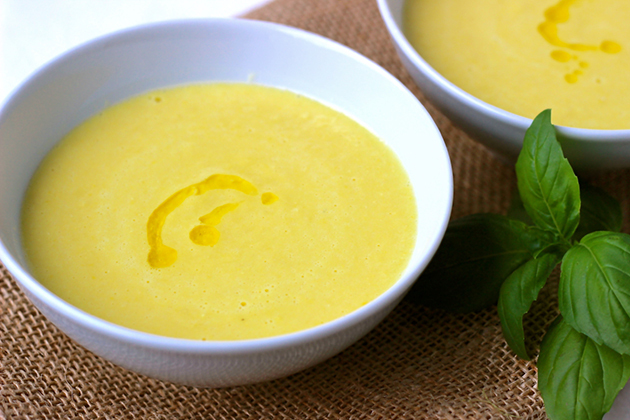 The first marinade is a vibrant and fresh Lemongrass Coconut Lime marinade. Lemongrass can be intimidating to break down with its tough fibers, but it is actually quite simple with the right tools. Use a sharp chef knife like the KitchenAid® Chef Knife from the 11pc Professional Series Cutlery Set to remove the root end of the lemongrass stalks, then cut them in half. Place the lemongrass stalks, coconut milk, fish sauce, fresh lime juice, fresh cilantro leaves, garlic cloves, vegetable oil, and fresh chunk of ginger directly into the jar of the Pro Line® Series Blender. Secure the lid in place and turn the Variable Speed Dial to 8. Blend for about 10 seconds or until the mixture is completely smooth. It’s amazing how fast the Pro Line® Series Blender will break down the tough lemongrass and fresh ginger while perfectly incorporating them into the marinade. No need for tedious mincing beforehand! Simply pour the Lemongrass Coconut Lime marinade over the prepared shrimp, cover and refrigerate. You can let the shrimp marinate for about 30 minutes, but if you are in a hurry, 10 minutes will still add incredible flavor to your shrimp. When you’re ready to grill, I recommend placing shrimp on skewers before grilling as it makes flipping the shrimp much simpler. The shrimp will take about 3-4 minutes per side to finish and then dinner is ready to go! This Lemongrass Coconut Lime Marinade is bright and fresh with a citrus kick from the lime. The process for the Sweet Chili Marinade is very similar to the Lemongrass Coconut Lime version. This second marinade gets its signature kick from the fresno chilis. I prefer to leave the seeds in the chili and simply remove the stem before blending. If you are looking for a slightly milder version, slice the chilis in half length-wise and remove the seeds before adding them to the Blender. Place all of the ingredients into the jar of the Pro Line® Series blender, secure the lid on top and turn the dial to speed 8 to blend. The Pro Line® Series Blender powers through the fresno chilis and honey to evenly incorporate all of the flavors. Depending on how much time you have, this marinade can be left on the shrimp anywhere from 10-30 minutes. Then, place the shrimp on skewers and grill on medium-high heat for about 3-4 minutes per side. The result? Two delicious marinated shrimp recipes that are sure to please everyone in your family! The next time you are brainstorming a fast and simple way to add flavor to a fast weeknight dinner, think no further than the KitchenAid® Pro Line® Series Blender to help you create quick and easy marinated shrimp. Share your take on this Marinated Shrimp – Two Ways recipe on Instagram using #MadeWithKitchenAid for a chance to be featured. 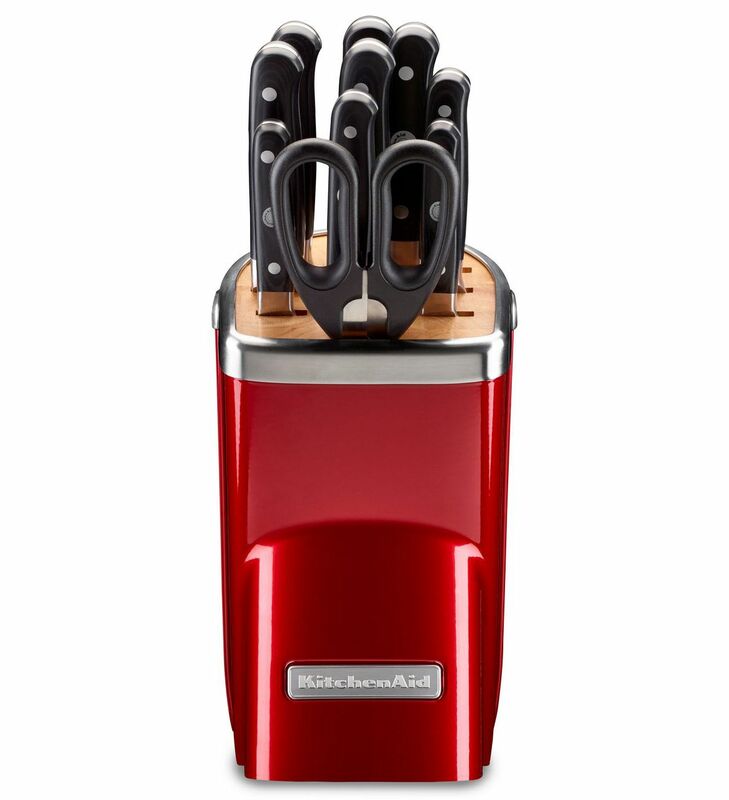 Use a sharp chef knife like the KitchenAid® Chef Knife from the 11pc Professional Series Cutlery Set to remove the root end of the lemongrass stalks, then cut them in half. Place the lemongrass, coconut milk, fish sauce, lime juice, cilantro leaves, garlic cloves, vegetable oil, and fresh ginger into the jar of the KitchenAid® Pro Line® Series Blender. Secure the lid and turn the Variable Speed Dial to 8. Blend for about 10 seconds or until the mixture is smooth. 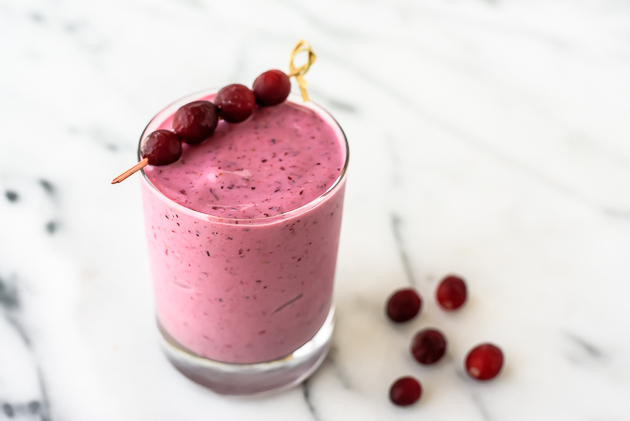 Turn off the Blender and set aside. Place the honey, rice vinegar, fresno chilis, soy sauce, water, garlic cloves, and salt into the jar of the Pro Line® Series Blender. Secure the lid and turn the Variable Speed Dial to 8. Blend for about 10 seconds or until the mixture is smooth. Turn off the Blender and set aside. Place the prepared shrimp into a medium-sized bowl. Pour the Lemongrass Coconut Lime Marinade or Sweet Chili Marinade over the shrimp. Cover the bowl with plastic wrap and refrigerate for 30 minutes. Note: If making both marinades, be sure to split the prepared shrimp amongst two medium-sized bowls and pour the Lemongrass Coconut Lime Marinade over one bowl and the Sweet Chili Marinade over the other. 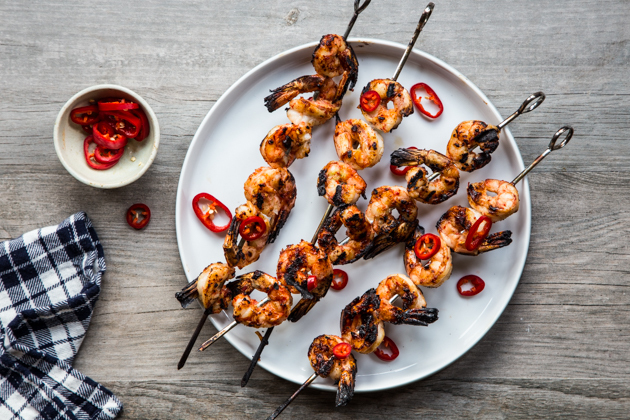 Place the marinated shrimp on metal skewers and grill on medium-high heat for 3-4 minutes per side. 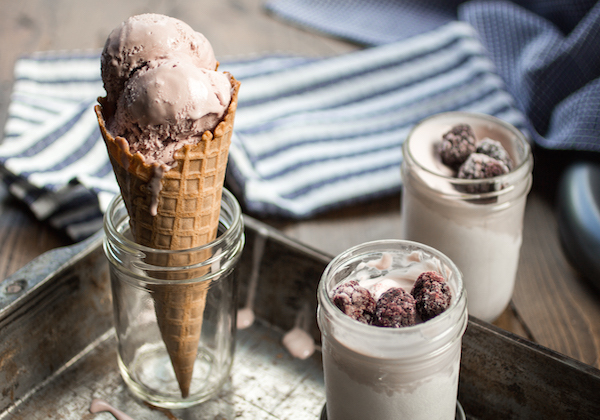 Serve immediately and enjoy.